FT-2200A The converter is designed to make Fiber Gigabit Ethernet conversion between 10/100/1000Base-T (RJ-45) / 1000Base-SX/LX(SFP) dual media to1000Base-SX/LX(SFP). 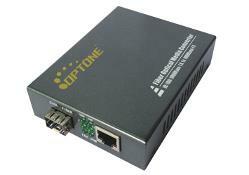 It is Gigabit Ethernet converter application. In addition, the converter implements jumbo frame forwarding capability. The overall network flexibility is enhanced, and the network efficiency is improved to accommodate and deliver high bandwidth applications. 10/100Mbps and full/half duplex automatically configure in TP port. Our Fiber Optic Media Converter Boxes come with many options, depending on the application. We offer multiple models with varied ports, including full-duplex and half-duplex.